The triumph of vegetation is total. The work that occupied the last years of Jed Martin’s life can thus be seen – and this is the first interpretation that springs to mind – as a nostalgic meditation on the end of the Industrial Age in Europe, and, more generally, on the perishable and transitory nature of any human industry. This interpretation is, however, inadequate when one tries to make sense of the unease that grips us on seeing those pathetic Playmobil-type little figurines, lost in the middle of an abstract and immense futurist city, a city which itself crumbles and falls apart, then seems gradually to be scattered across the immense vegetation extending to infinity. That feeling of desolation, too, that takes hold of us as the portraits of the human beings who had accompanied Jed Martin through his earthly life fall apart under the impact of bad weather, then decompose and disappear, seeming in the last videos to make themselves symbols of the generalized annihilation of the human species. They sink and seem for an instant to put up a struggle, before being suffocated by the superimposed layers of plants. Then everything becomes calm. There remains only the grass swaying in the wind. The triumph of vegetation is total. Final paragraph of Michel Houellebecq’s The Map and The Territory, p. 269. First Vintage International Edition, November 2012. Trans. Gavin Bowd. 2012 may mark the year that New York City’s High Line became too big to fail. This is exactly why it must. Let’s start with the basics. Friends of the High Line (FoHL), which is the first organization in the New York to license a public park from the city, listed 84 people on its staff in 2010 to manage and operate a 6.7 acre park (12.5 staff per acre). Compared to the Friends Hudson River Park and the Hudson River Park Trust combined (17 staff for 550 acres = .03 staff per acre), the Central Park Conservancy (367 staff for 843 acres = .4 staff per acre), or the Prospect Park Alliance (263 staff for 585 acres = .44 staff per acre), this is the most highly staffed particular park per acre in the City. [Sources: 2010 Federal 990 filings for individual organizations, except HRPT, for which I used the website to count the staff.] Then there’s the park’s capital requirements for the construction of the third and final section of the High Line: $90 million dollars. This brings the total cost of construction for the park close to $250 million dollars, slightly less than the estimated $266 million (inflation adjusted) that it cost to build Central Park in the 1850s. An estimated 3.7 million visitors in the past year. But I’m already getting too mired in the gargantuan numbers, numbers that will surely continue to pile up before the park is completed. What 2012 really represents for the High Line is the year of gentrification. Now, nobody could argue that 2012 is the first year that the überpark has been entangled with the ongoing third-wave gentrification of Chelsea, the West Village, and the Meatpacking District. These neighborhoods each have complex and specific histories of first- and second-wave gentrification (look into Neil Smith if you’re unsure about this periodization) into which the Friends of the High Line stepped when they began their effort to save the rail line in 1999. Increasingly incredulous is the Friend’s narrative of grassroots advocacy, considering that the not-for-profit development juggernaut has not only accelerated, consolidated, aspirationally depoliticized, and deeply institutionalized the gentrification of these neighborhoods, it has also set a global precedent for how-to-gentrify the innumerable disabused transportation lines that span many miles of urban space. Who would have thought that a copycat organization advocating for an as-yet unproven light filtering technology to support photosynthesis in an underground park below Delancey Street – a.k.a. the Low Line – would have ever been taken seriously in prevanchist New York? 2012: the year gentrification went underground. These new modes of ecological, state-supported gentrification need closer analysis, and, as the global standard-bearer of this experiment, the High Line is ground zero. The biggest stories for the High Line in 2012 fall into two categories: development and media criticism. From a development perspective, the last year witnessed two landmark events. The groundbreaking of the new Whitney Museum, a $720 million, 200,000 square foot, Renzo Piano building at the foot of the park on Gansevoort Street. If the High Line’s feet are in the art world, its head is undoubtedly ballooning into the vast empty spaces of big league real estate development. Here, on the account of its convergence with the Hudson Yards development project, or what I like to call ‘the new midtown‘ (the amount of office space under development is roughly twice the amount in all of downtown Seattle) the High Line’s pro-development stance takes on a new order of magnitude. American cities are always looking for quick fixes to revive their moribund downtowns. Sadly, the dismal record of failed urban design strategies is long: downtown shopping malls, pedestrianized streets, underground passages, skyways, monorails, festival marketplaces, downtown stadiums — and that most elusive fix of all, iconic cultural buildings. It appears likely that we will soon be adding elevated parks to the list. Rybczynski’s op-ed seemed but a fly on the fresh pile of enthusiasm expressed for the opening of the park’s second phase and its purported $2 billion in affiliated real estate development; he can be read as a curmudgeonly planner unwilling to jump on the glittering green growth wagon. Indeed, it seems he was as much responding to another trend as he was predicting the High Line’s efflorescence in an ever-expanding list of copies: Philadelphia’s Reading Viaduct, London’s Fungus Tunnel (my favorite name), Atlanta’s Beltline (in which HR&A Advisors, the High Line’s power consultant – its chairman, John Aslchuler, is the current President of the board of directors of FoHL – is also involved), Chicago’s Bloomingdale Trail, and Toronto’s West Toronto Rail Path, to name a select few. But this simultaneous Bilbao-esque global diffusion (As Roger Keil suggested in a November 2012 tweet responding to this article on a Sydney version) and northward march of the überpark in 2012 has been greeted with another kind of response: finally naming the park’s unique brand of gentrification. I intervene with an ‘o’ to suggest that the eruption, capture, and management of wild urban naturecultures, to use Donna Haraway’s wonderfully conflated term, has much to do with the politics and anxieties of displacement as the effect of gentrification. Those ‘disturbed’ post-industrial spaces which so often are the next gentrified neighborhood are characterized by a quality of weediness and seediness; something and someone appears to be out of place. The vitality of claims to abandoned spaces reflects their relative openness to being repurposed for new needs and desires emerging in the post-industrial city. The empirical displacements both of the High Line’s queer ecology and the residents and businesses of adjacent neighborhoods calls for a concept which can attend to the relationship between these phenomena over a specific period of time, one which I typically delimit in terms of abandonment. In short, ec[o]topia is an attempt to describe the anomalous relation of sexuality to nature in the midst of a real urbanization process. It is further a gesture toward linking political possibilities for human resistance to particular forms of displacement to the ontological conditions and material realities of existing urban-natures. Here, the ‘displacement’ of former uses and significations helps to create not only new imaginative possibilities, but also new or revived forms of material engagement with and in nature and the city alike, including sexual relations. [T]he High Line, whatever else you can say about it, is a sincere and original response to a genuine social phenomenon. It does what any great work of visual art does, which is to take an inchoate emotional sense shared by a large group of people and make it concrete, visible in three dimensions. What you make of it is largely determined by what you think of its underlying subject, which in this case is gentrification. If you are part of the community pushed out by the new wealth gentrification inevitably brings, then no doubt the High Line’s precious attention to symbols of decay and ruin — all those meticulously landscaped weeds — will seem calculated to piss you off. If, on the other hand, you are part of a gentrifying wave, as so much of young New York now is, then the High Line will seem to be singing from your hymnal, and you will revel in the distressed steel girders and exposed brick walls. I give Bourne serious points for naming gentrification as the issue, but I think that his poorly divided, artificially coherent camps ‘for’ and ‘against’ gentrification – not to mention his unaddressed foundationalism – invents a non-existent duality and loses the complexity of the dynamic of gentrification. I mean, of course, that he too easily makes gentrification a phenomenon owned (unambiguously) by ‘the young,’ missing both important points of resistance in the very same neighborhood and opting out of a more highly differentiated reading of the racialized, classed, and gendered dynamics at work. I’m thinking here of the efforts of Fabulous Independent Educated Radicals for Community Empowerment (FIERCE!) who, with their LGBTQ youth of color focus and grassroots politics, have actively resisted gentrification, have continually named the racialized and gendered components that drive or accompany gentrification, and have pushed for spaces that are explicitly rather than incidentally queer. Emerging in response to the threats to queer space and queer lives on the west side piers and to the increase of police profiling and violence in the West Village and NYC more broadly (remember Amadou Diallo and Abner Louima? ), FIERCE! first grabbed my attention between 2006 and 2008, when I was doing research for a major paper on the queer and environmental history of the west side waterfront and the present Hudson River Park. For me, FIERCE!’s politics get at two important questions about the convergence of sexuality and public space development: What is it about the creation of parks that naturalizes the displacement of queer uses and bodies, including racialized bodies, from public space? And: What might a queer politics of urban public spaces of nature look like if it were to be democratically shaped by radical politics? For me, both of these questions take on a unique character in the context of the High Line’s gloss on ecologies of public space. I had often wondered what it would be like to climb that graffiti-marked trestle with its wild urban meadow. Of course, I’d seen the architectural renderings and knew not to expect a wilderness. Still, the idea was enticing: a public park above the hubbub, a contemplative space where nature softens the city’s abrasiveness. Inspired by the melancholic, unruly beauty of the High Line, where nature has reclaimed a once-vital piece of urban infrastructure, the team retools this industrial conveyance into a post-industrial instrument of leisure, life, and growth. By changing the rules of engagement between plant life and pedestrians, our strategy of agri-tecture combines organic and building materials into a blend of changing proportions that accommodates the wild, the cultivated, the intimate, and the hyper-social. In stark contrast to the speed of Hudson River Park, this parallel linear experience is marked by slowness, distraction and an other-worldliness that preserves the strange character of the High Line. Providing flexibility and responsiveness to the changing needs, opportunities, and desires of the dynamic context, our proposal is designed to remain perpetually unfinished, sustaining emergent growth and change over time. The designers worked with a narrow vision of landscape, that familiar idiom, to stage an intervention that would call upon the power of the vegetal-ecological imagination to distract from the harsh socioeconomic realities of the High Line’s redevelopment. On the one hand, this scrubbed the High Line of its industrial past while, on the other, it obscured the various destructions undertaken in the name of improvement. The latter obscures and deemphasizes the radical potential of cruising the space while deemphasizing so-called ‘unruly’ ecological figures like invasive species and urban animals. None of these destructions are registered in the non-existent list of losses (costs? ), even among vocal critics of gentrification. If we are to try to take full account of the historical memory, we must also include the AIDS genocide among the forces that make the High Line both so ‘successful’ and so powerful a displacement in the city of queer historical memory. The AIDS genocide played a huge factor in making various parts of Lower Manhattan ‘open’ for new residents (See Sarah Schulman’s book Gentrification of the Mind for both concrete figures and more lyrical and textured analysis on this point. I might add that I have often wondered what an effort to establish the High Line as a memorial to the AIDS genocide might have looked like. I’m thinking here of Derek Jarman’s gardens in Dungeness.) A version of the project which focused more centrally on the enmeshed queer ecosystem of the abandoned High Line might have yielded a notion of value quite different than the one that is presently being enshrined in the park’s glittering and untouchable planting beds. In a constantly changing city, with soul-destroying development running rampant, we might look at this project another way: how lucky we are that the team that restored the High Line did so with such sensitivity, innovation, and authenticity. Other neighborhoods will not be so lucky. So, because the High Line itself so carefully reconstructed an urban pastoral, we cannot hold ‘it’ responsible for any of the negative effects issuing forth. Green is good, and only that. ‘Other neighborhoods’ (or does La Farge mean to say, neighborhoods of the other) will simply miss out on luck. This argument serenely obscures the incredible powerbrokerage of the whole undertaking with an endlessly Instagrammed planting bed. Remember, ecology is about human and non-human interaction in systems of constant change, but simply labeling the city as a space of constant change is not enough to bypass the political and personal responsibility that the Friends, its boosters, and city politicians actively claimed for themselves, often times against existing, if fledgling, community efforts to envision alternatives for the space. They were for it before they will be against it. The Times itself printed several responses to Moss (to which, if you want to go down the rabbit hole, Moss responded here), including from David and Hammond themselves. The co-founders retort: “To claim, as Mr. Moss does, that the High Line was never about the neighborhood is not true and an unfortunate simplification of our past and current reality.” A veritable no-comment, backed up by a series of less noteworthy respondents who seek to undercut Moss’s gentrification argument through Darwinization (“cities evolve”), an argument for organicized self-policing (“Jeremiah Moss’s appreciation for the High Line will most certainly blossom the moment he begins to manage his expectations about living in New York.”), and with expressly ambivalent sympathy on account of the “inevitability” of gentrification. Of course, David and Hammond’s 2011 ‘tell-all’ book on the project, High Line: The Inside Story of New York City’s Park in the Sky, is where the real defense is to be found. In it, the duo seem to be at great pains to suggest not only their generally progressive politics (David recounts attending anti-Iraq war protests), but also their specific disagreements about the involvement of developers and real estate power-players in the High Line process (with Hammond more in favor than David in early phases). When I attended a reading of the new book in November 2011 at Chelsea’s 192 Books, Josh David started by reciting a long passage from the beginning of the book in which he firmly placed the High Line at the center of a certain bygone era of gay grit in Chelsea by situating it among the Spike (closed) and the Eagle (relocated), two well-known leather bars. So, it seems that my desire to talk about the High Line as queer gay urban ecology, might fly just alongside the Friend’s own melancholic narrative of loss and reinvention. A narrative, not insignificantly, which reached full flower only after the earliest phases of the project opened. This timeline seems to affirm the notion of inevitability which is trotted out in front of anyone who remains attached to the idea that the High Line might have been ‘saved’ with a lighter touch, or even no touch at all. LUNCH BREAK My favorite place to eat is a restaurant called Moustache. It has been in the neighborhood since I moved in. If I want to eat outside, I’ll go to the Christopher Street pier in Hudson River Park. If I go to the High Line, it feels like work. I see things I want to change and end up sending e-mails to people. It’s not as much of a break for me or my staff. Christopher Street used to be this crumbling pier. I was sad when they were going to turn it into a park, because it was such a great ruin and I thought it would change the dynamics. You had these transsexual kids and then yuppies like me. I had a picnic there recently and it’s still this great cross-section. Here again, the handsome Hammond (several paparazzi-style shots in the article flatter the formerly named ‘most eligible confirmed bachelor;’ he’s got a boyfriend that makes him açai smoothies now.) displays a pathos confirmed by the Inside Story anecdote in which Hammond saves “his favorite” comment card from an early exhibition on the High Line Ideas Competition. The anonymous commenter wrote: “The High Line Should be preserved, untouched, as a wilderness area. No doubt you will ruin it. So it goes.” Hammond explains his preference for the sentiment: “It spoke to my biggest fear: I loved what it was like up there, as it was. I was afraid that no matter what we designed, it would lose that magic. Until the day we opened, I was secretly scared that we were going to ruin it” (p. 61). Read alongside the Times piece, in which Hammond lumps himself in among the ‘great cross-section’ of the piers, we can infer a certain amount of exhaustion with being held responsible for every effect of the project. And what of the extended period of struggle in which those ‘transsexual’ (a term in waning use in these communities) ‘kids’ on the pier are presently engaged? Hammond deploys the Hudson River Park as a foil to his own overblown project. It’s hardly a secret that in the years since the park opened, the well compensated Executive Director, has put a lot of experiential distance between himself and the project, taking up the American Academy’s Rome Prize, among other diversions. One wonders where the postcard hangs today. On the other end of things, Liz Diller, professional partner and wife of Ricardo Scofidio, is introduced by a recent Guardian profile (more bombastically titled “Liz Diller: ‘We thought we would have been fired a long time ago“) as “One of the few people not completely mesmerized by [the High Line] and ready to move on from it – who, indeed, believes it is not replicable…” Nevertheless, she professes to be “totally amazed by now many New Yorkers are really thankful and love to go” (my emphasis). With little more than a semicolon, she follows up with her concern that the High Line is “almost too popular for its own good. It could easily consume itself.” Would that be the completion of an ecological feedback loop embedded in the sustainable design of the project? No further reflection required; Ms. Diller “Has other things on her mind.” Indeed, any professional whose project spawns endless copies is likely to move on as quickly as possible to commissions and recognitions, while doing little to account for the localized implications of their work. 1. 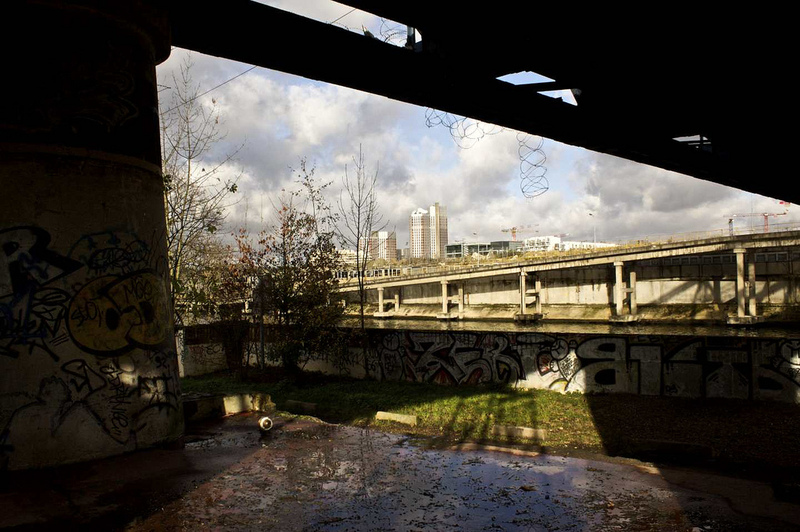 What would a politics of non-intervention in abandoned urban spaces look like? How is it complicated by that-which-remains and that-which-emerges in every abandoned place? 2. Are queer urban ecologies worth ‘preserving’ as such? Is it possible to imagine doing this without bloated, institutionally managed, politically narrow-minded advocacy? Can we do this without creating golden calfs? 3. How might a sensitivity to the particular relations of sexuality, nature, and urban spatial politics in historically specific settings inform a radical agenda of anti-gentrification? 4. Is it still possible to imagine a High Line which isn’t rendered moribund by tightly scripted regimes of capital accumulation and real estate development? 5. How can an explicit politics of anti-homonormativity (normalization of white, male, bourgeois, sexual citizenship) be translated into tactical and strategic political actions for radical spaces and natures in the central city? 6. How can scholars, activists, and people of radical persuasion disentangle themselves from co-opted ‘artistic’ and ‘ecological’ development schemes while still retaining a discourse and practice of affirmative artistic and ecological resistance to such schemes? In other words: How do we stop this from happening again, let alone from becoming a global model for development? Can someone be held responsible for this? It strikes me that there are two thematic lines emerging from this sextet of questions. The first involves a more thorough exploration of the dynamics and politics of abandonment. While accepting the reality that abandoned properties are part of the circulation of global capital (dross), we might consider how recent tactical and strategic efforts by Occupy and other mid-crisis public-space activisms inform our ability to critique gentrifying projects which mask themselves in discourses of ‘public access,’ ‘sustainability,’ and ‘community input.’ If Friends of the High Line is a community organization, then why is it necessary to name and confine its formal interactions with the community to a model based on meaningless consultation of expert-backed plans? If neighborhood residents claim the power of abandonment or, better yet, radically refuse institutionalized reclamation, it might be possible to politicize the alliance of soon-to-be-displaced residents with soon-to-be-displaced ecologies in which they are enmeshed. The second involves continual poetic, literary, and artistic efforts at engaging with the ecology of ruins. From Walter Benjamin onward, ruins have remained a captivating thoughtspace for the ‘return to/of nature’ from some of the most materially developed circumstances. The quality of being unmade by forces of vegetality and animality grants ruins a unique position in both cultural and natural imaginaries and in the purview of geophilosophical inquiries into the shape of a posthuman world. We have seen that such power is readily co-opted by capitalist processes of real estate development, which are always on the lookout for ‘new desires’ to commodify. How might a necropolitical embrace of the ruin, one which imagines a responsible and respectful lâcher politique, return us to the forgotten politics of death in the central city? Rather than developing for one-who-might-arrive in response to the clarion call of gentrified streets (messianic development), what if we sought to take responsibility for our hand in the death of previously vital incarnations of those same spaces (an ethics of care)? In the wake of Hurricane Sandy, in which the hardscape of the High Line fared relatively well even as Chelsea was ravaged, ecological design is likely to be put forward as a necessary part of infrastructural preparedness for the next natural disaster. Inevitability in another guise. The securitization of the cityscape through ecological intervention will doubtless represent a more tightly scripted regime of security-nature-development in which the needs and interests of particular communities will be overrun by the Green Greater Good. Indeed, we are witnessing the beginning of a public dialogue in which some prominent environmental voices are willing to argue against a right to return. The politics of this position are not wholly obvious. On the one hand, it enforces consequential responsibility on the displaced, implying that the state has no responsibility for the suffering of these people. On the other hand, it contains a strong argument in which the naturalization of human intervention in spaces which appear to belong only to culture is no longer taken for granted. While anthropogenic factors have an undeniable role in the very forces which rendered Sandy so destructive, we may begin to wonder how the immanent struggle to remain in one place and to determine the material conditions of one’s own life – arguably the core of any anti-gentrification effort – stacks up in the new era of intensified gentrification and increased urban vulnerability. Writ small, the High Line demonstrates what happens when these forces operate at a vegetal, rather than a climactic pace and scale. With a sincere desire to avoid depoliticized apocalyptic narratives, I have offered ec[o]topia in the spirit of thinking through the experience and reality of being constantly out-of-place. Any attempt to locate a group with the most legitimate claim to a ‘right to the city’ is already caught up in the ongoing reality of displacements of one kind or another. This does not make all claims to a place equal; gentrification and displacement are real and must be resisted in situ. It does, however, suggest, that, as our cities produce increasingly entangled and novel ecologies, what I call queer urban ecologies, we will need to draw on both familiar and queer tactics, both involving closer attention to the ground on which we stand and consequential awareness of the long line of displacement from which we all descend to the streets to fight. If what we seek is justice, then we must be prepared to work with the unruly figures to whom ‘the next big thing’ is constantly being abandoned. † I should point out one of the more interesting aspects of the HY + HL convergence, the “Save the Spur” campaign. This instance of institutional activism can be traced back to the earliest days of the Friends of the High Line. In this 2009 video, which is perhaps worthy of its own substantial analysis, everyone from Rep. Nadler to a red-t-shirted Robert Hammond jumps in on spur-related advocacy even before the rest of the park had been secured for redevelopment. This brings to mind an action by FIERCE! (Fabulous Independent Educated Radicals for Community Empowerment) just a few months earlier to oppose overblown development as part of the Pier 40 / Hudson River Park redevelopment. (More on this above…) Related Companies, which won the initial bid to redevelop Pier 40, would later become the lead developer on the Hudson Yards, after Tishman Speyer withdrew their initial winning bid. Related’s proposal for the pier – dubbed Vegas on the Hudson – was later found to be financially unfeasible for the cash-strapped park. The future of the space is still unresolved following the resignation of power-developer Douglas Durst from the Friends of the Hudson River Park Board of Directors. †† Here, I am talking about the abandoned High Line; the lost space which existed between 1980 and the opening of the park.